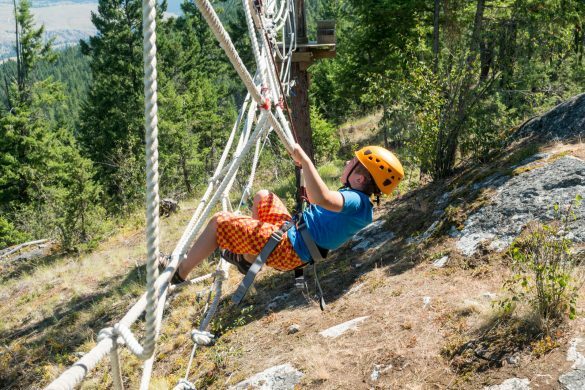 Myra Canyon Adventure Park in Kelowna, BC is an awesome place for families to get outside and test their strength, balance and grit up in the trees! 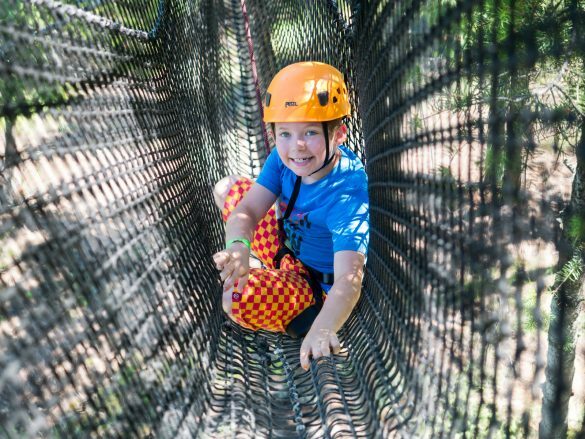 The park has two separate tree course areas: a Kinder Tree Course Area (suggested age 3 to 12) and the 7 Tree Courses Area (for adults and kids 4’6″ and taller). I’ve provided details of each area below, along with some other fun things to check out, and five tips for visiting Myra Canyon Adventure Park with your family. The Kinder Tree Course Area (suggested age 3 to 12) is tucked beneath the trees which provides some nice shade throughout the day. The course has bridges, ropes, nets and a fun zip-line at the end. Parents can choose to go into the course with their child or watch from the ground. When we arrived my two younger children (5 and 7) were outfitted with helmets and introduced to one of the friendly park guides who quickly learned their names. My kids had such a great time looping through the Kinder Tree Course, each time gaining more and more confidence. While my two younger children were at the Kinder Tree Course (with my husband), I took my son (9), who just reached the 4’6″ cut-off, to the 7 Tree Courses Area. It’s a quick walk down and up the hill to reach these courses – the warm-up! At the top we were outfitted with helmets, harnesses, gloves (optional) and a hefty Koala zip-line hook (our life line – not optional!). The friendly guide told us the rules (there are two) and off we went to challenge ourselves. Each course has various challenges to cross over: ropes, bridges, zip-lines, nets, a toddler push car, a horse saddle, large balls… It was a hoot! The park website suggests putting aside about 1.5 hours to complete the first four tree courses depending on fitness and comfort level. It took my son and I just over one hour to complete them and my husband only a half an hour (I think he was showing off). The last two Tree Courses (number 6 and 7) are more difficult than the first four. The guides don’t recommend that kids (just at the height limit) try because they are much more reach-y. Despite the warning my son insisted he have a go and he required serious effort to complete Tree Course 6. He opted not to do course 7 but it ended up being a bit easier than course 6. Myra Canyon Adventure Park also has four ziplines for children, various small challenges, low ropes games, a slack line mini park and and a disc golf course (18 holes, 9 permanent and 9 temporary). Accessing the disc golf course is free anytime and the extra games and challenges are included in the Tree Course passes. 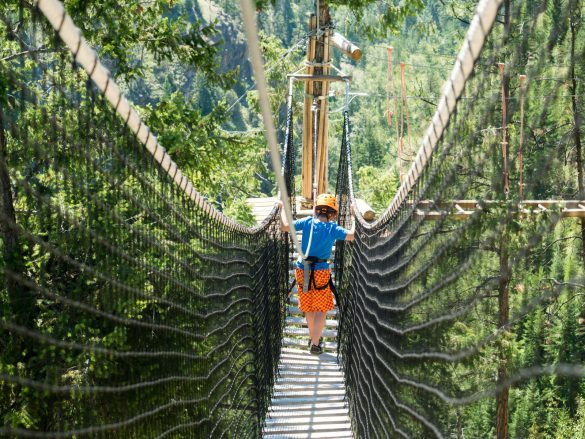 There are lots of things we loved about Myra Canyon Adventure Park. The Tree Courses are a blast and the views of Myra Canyon and Kelowna from the 7 Tree Courses Area are gorgeous. Even as we were leaving my kids asked when we would return. We didn’t have time to try out all the other fun stuff so there will definitely be a next time! The other thing that we loved about Myra Canyon Adventure Park was the vibe. From the manager to the guides, everyone was kind, helpful and happy (ps. they didn’t know I was going to be blogging about our time there). Sometimes adventure parks can have tons of rules and feel stressful with kids but I assure you this was not the case. 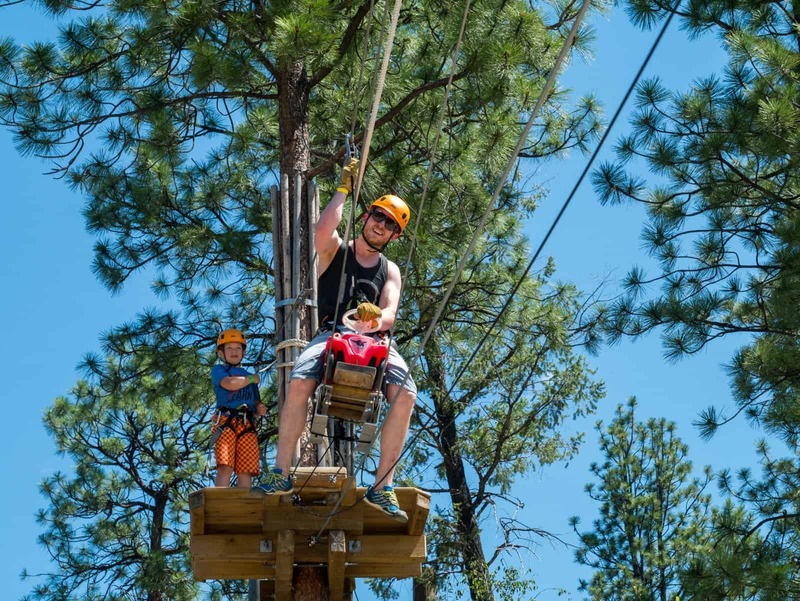 Safety is important at Myra Canyon Adventure Park but so is having fun! 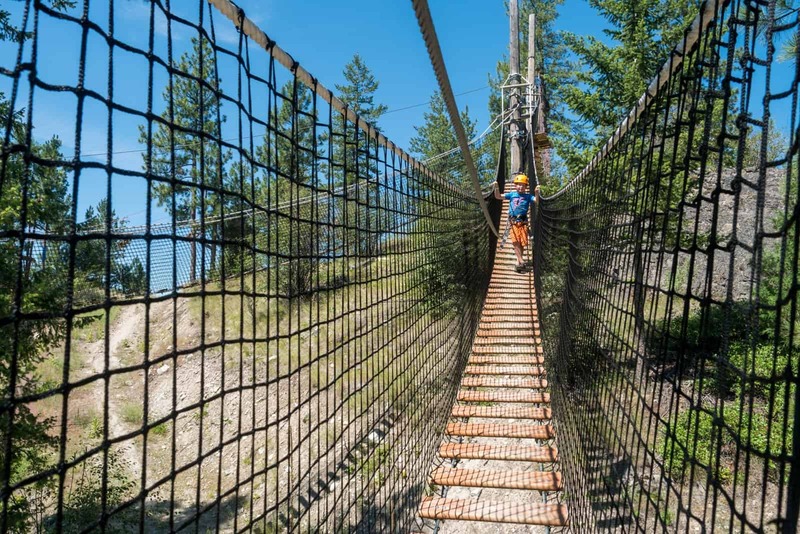 For this reason I definitely recommend Myra Canyon Adventure Park as a must-do family friendly adventure destination. 1. Go first thing in the morning. 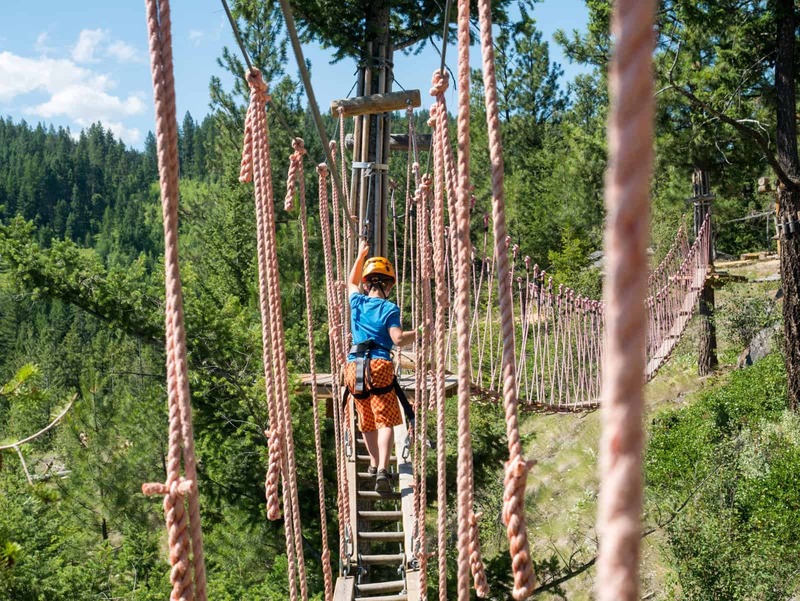 In the summer month, Myra Canyon Adventure Park opens at 10:00 am. For families with younger kids this is the prime time to go. In the morning the Kinder Tree Course Area is partially shaded and not too busy. The 7 Tree Courses Area are more exposed to the sun and can quite hot. For bigger kids try these courses first thing in the morning (or later in the day, after 5 pm). Check their website for spring and fall hours. 2. Bring plenty of water and snacks (or lunch). The tree courses get your blood pumping and tummy growling. It’s a good idea to bring lots of water and energy packed snacks. There’s nothing worse than having to leave early because people are getting hangry. You can buy pop and freezies at the park entrance and there are water dispensers and disposable cups too. However, it’s a good idea bring a least one reusable water bottle and refill as needed. 3. Wear sunscreen and closed toed footwear. The Kinder Tree Course and the 7 big Tree Courses are partially shaded so suncreen is a must. Also, shoes or closed toed sandals (like Keens) are necessary for the Tree Course. It wouldn’t be fun to loose a sandal while balancing your way across a tightrope! 4. Leave the jewelry at home and tie up long hair. Earnings, bracelets, watches, necklaces and long hair… leave them at home. Well don’t leave your hair at home, but definitely tie it up. Chances are these things will get caught up in the nets and cables. There’s nothing worse than trying to unravel you child’s hair from a net – ouch! If you have children of various ages (and heights) you might think that this adventure park will be too tricky to manage, but let me assure you that it’s definitely doable. One way of keeping everyone happy is to divide and conquer. This requires at least two adults so bring along your partner, family member or willing friend. The extra adult doesn’t even have to participate, which means they don’t have to pay a fee. Here’s how we made it work with our three kids (age 9,7 and 5). While my husband took our two youngest on the Kinder Tree Course, I took my eldest son on first four Tree Courses. Once we were finished we met up at the picnic table up by the Tree Courses for a snack. During snack time my husband took his turn on the Tree Courses. We continued to swap back and forth until everyone had their adventuring needs met and it worked out great. Myra Canyon Adventure Park is located south-east of downtown Kelowna, at 4429 June Springs Road. The park overlooks the KLO Creek Regional Park and lies below the scenic Myra Canyon trestle bridge trail. Disclaimer: A big thank to Myra Canyon Adventure Park for providing our family with complimentary passes. As always, all thoughts and opinions shared in this post are my very own. Hi there! Thank you for the tips! I was wondering if you camped nearby? Or do you have any recommendations regarding accommodation? Much appreciated :). Hi Karen! We have some family connection in Kelowna so we did not camp this time. The closest spot to Myra Canyon Adventure Park is Canyon Farm RV Park (http://www.canyonfarmsrv.com/). However, if you’re tenting I would try to find a place out of the city like Bear Creek Provincial Park or Fintry Provincial Park (a bit father). I hope that helps!